A fresh explosion has occurred at a major shopping mall, Emab plaza, in Wuse 2, Abuja. Nigeria’s capital city, on Aminu kano crescent. The explosion apparently occurred at the gate of the busy plaza. The explosion occurred on a day Nigeria is playing Argentina in the FIFA world cup going on in Brazil. This entry was posted in Uncategorized and tagged Abuja bomb explosion, banex bomb explosion, Boko Haram, Nigeria. 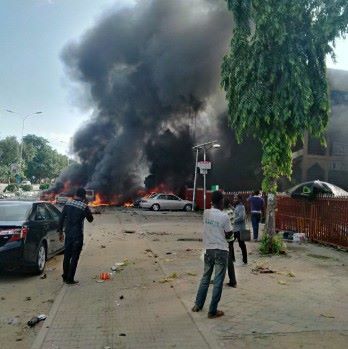 PICTURES: ABUJA FRESH BOMB EXPLOSION.